Lexington, Mississippi, Temple Beth El. Photo: Bill Aron from Shalom Y'all (used with permission). (ISJM) The other day I posted about a Polish synagogue celebrating Rosh Hoshanah services for the first time in a quarter century. On the side of the coin, and from the other side of the world, comes news that yet another small Southern American synagogue is set to close. Andrew Muchin in the Forward (click here for article and photo) reported that the 104-year old Temple Beth El in Lexington, Mississippi celebrated what is likely to be its last High Holiday service. Lexington is the smallest place in Mississippi where a Jewish community has survived for a considerable period of time. The future of the building has not been decided. Fortunately, there is no urgency to destroy, move or reuse it. This closure is due to a dwindling Jewish presence in the small Mississippi town, not a deteriorated building or pending development. There are several paths the congregation may choose to follow. The Lexington story is just a chapter in the continuing history of transformation of small town American Jewish communities. I have written about this process many times before, since I visited Mississippi in 1991 to speak at the centennial "celebration' of the (now former) synagogue in Port Gibson. The likely closure of Lexington follows that of Brookhaven (see my earlier post). That synagogue will be used as a town museum. 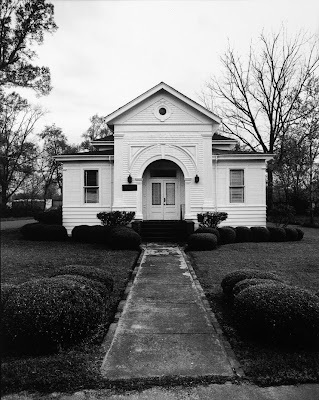 The Museum of the Southern Jewish Experience in Utica, Mississippi, now a constituent part of the Goldering Institute for Jewish Life has long tried to track and manage such synagogue closures. In a few cases former synagogues have become branches of the museum - but needs and funds can only support a limited number of such institutions. 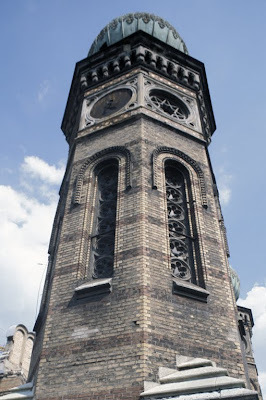 In the worst case scenario, it is now hoped that congregations plan in advance for the eventual closure of their synagogues, and work to carefully preserve their records and their Judaica, and consult with local and national experts about the proper way to protect and preserve this heritage and their building. 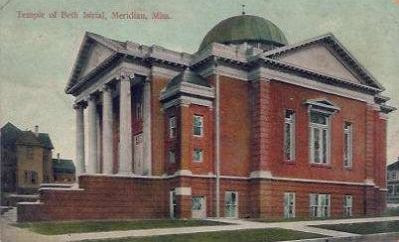 Many of the Mississippi synagogues were built at the turn of the 20th century and are fine examples of vernacular religious architecture and in many cases, local versions of the preferred (after about 1900) Neo-Classical style favored by the Reform movement. The Lexington synagogue is a fairly simple and restrained version of this style, but is still a member of this group of structures which once included synagogues in Meridian (demolished 1964), and the still-extant buildings in Natchez (1905) and Greenville (1906). Meridian, Mississippi. Former Synagogue, demolished 1964. Will the Lexington Synagogue building survive? “Next year, he and the other local congregants will attend synagogues in nearby Mississippi cities. Meanwhile, he expects that Beth El will open its doors for an occasional life cycle ceremony. According to Munchin "the synagogue’s well-maintained interior is 90% sanctuary. Each side wall features four tall stained-glass windows with intricate Tiffany-style patterns." This is in keeping with Natchez and Greenville. Munchin writes "the simple symmetrical exterior with its tall, gabled front porch resembles a rural church. The only visible Jewish symbol is a round window with a small, six-pointed star above the entry." This is not entirely true, since few churches at the time would have had such a prominent arched facade. The Brookhaven synagogue was more "church like." But the limited decoration was certainly par for the time. For a later example see the facade former Chevra T'helim, an Orthodox Congregation in Portsmouth, Virginia). Portsmouth, Virginia. Former Chevra T'helim, now Jewish Museum and Cultural Center. (ISJM) Earlier this month I had the pleasure of lecturing at the Jewish Museum and Cultural Center in Portsmouth, Virginia, housed in the newly restored former Chevra T’helim (House of Psalms) synagogue. Chevra T’helim was founded in 1917. IN the following year, the new Orthodox congregation purchased its property at 607 Effingham Street, where it began to build a new synagogue. The result is a building that combines Old World and New. The brick exterior is fronted by a Colonial style columnar façade. Inside, the architecture and furnishings maintain a traditional Eastern European synagogue arrangement with galleries for women in three sides and a central bimah. The brick exterior is fronted by a colonial style columnar façade. Or so it seems at first but it's not as simple as that. 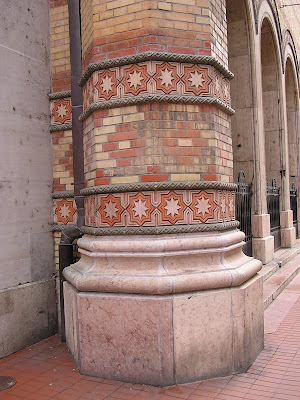 The façade columns are much taller than one expects in a traditional Georgian/ Colonial Building, and above, in the pediment, is a Magen David. The columns are sheathed in metal; something strange to me, but that I was told was not uncommon in the South- apparently wood in this climate is susceptible to rot and insect infestation. The Magen David, however, is decorated with light bulbs, and that is something I know is uncommon everywhere. Inside, the classical Ark breaks tradition, too; it has decorative lightbulbs along the intrados of the arch. Crowning the Ark, as in many Eastern European and American immigrant synagogues of the time, is a pair of carved lions flanking a Decalogue. But these lions are special, too. They have red eyes, lit by colored lights that flash on and off. Chrevra T’helim isn’t the only example of this love of (electric) lights. In Baltimore, the immigrant Orthodox Congregation that took over the 1876 B’nai Israel Synagogue on Lloyd Street in 1895 installed festive electric lighting on its ark, probably around 1910. Similar lights decorate the Ark at New York’s Eldridge Street Synagogue. Murray Zimiles exhibited several examples of red-eyed lions in his "Gilded Lions and Jeweled Horses" exhibition at the American Folk Art Museum. One pair of lions originally from Scranton, Pennsylvania also has light bulbs for eyes. I don’t know if they flashed! The timing may have been coincidental that the region’s oldest congregation, Temple Ohef Shalom – originally Orthodox but Reform since the mid-19th century – also laid the cornerstone for their new Temple in 1917. Temple Ohef Sholom (of which I hope to write more later) is a massive Neo-Classical building designed in tandem with an imposing Methodist Church across the street. At the time Norfolk and Portsmouth were only connected by ferry. The cultural divide between Cheva T’helim and Ohef Shalom was even greater than the geographic distance. Still, both Reform and Orthodox congregation used columnar facades – no doubt to emphasis their American spirit. 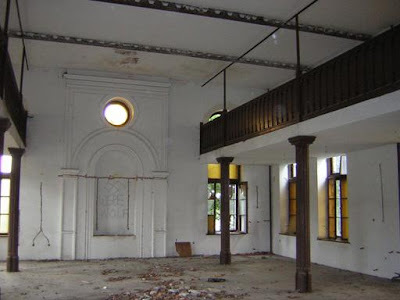 Restoration of Portsmouths’s unused and deteriorating synagogue began in 2001 after intense and sometimes acrimonious negotiations among several groups seeking the site. As in Boston in the early 1990s, where at the Vilna Shul a small Orthodox congregation aged and died, leaving the future of its building unplanned, so too, in Portsmouth, where only one surviving trustee remained committed to the building. Eventually, the courts ceded control over the congregation’s cemetery to a Conservative Synagogue that has its cemetery immediately adjacent, but the independent not-for-profit Friends of Chevra T’helim was able to secure the building, with the promise to protect and preserve it. The fact that this not-for-profit citizens' group had already been formed gave it the standing to receive the building without further litigation. The goal of the restoration project is now partially achieved: the 1918 building itself is secure, intact and restored. It can now host visitors and small events, including the lecture series to which I contributed this year. To do more, however, The Museum and Cultural Center needs more space, and the next phase of the project is to build a modest structure at the north side of the synagogue (where there is now an empty lot). This building will house an archive and exhibition space with memorabilia and historical material from Jewish families of the Tidewater Region. The new building will also house the necessary restrooms, service areas, elevator, and conservation work spaces. At present, despite the fact that a new $50 million Jewish Community Campus has been erected on the edge of Norfolk on the way to Virginia Beach, there is no active Jewish historical center or archive for the region. The Friends of Chevra T’helim look north to what has been achieved at the Jewish Museum of Maryland in Baltimore, and also the successful state-of-the-art Jewish archive at Beth Ahabah in Richmond, Virginia, and they have high hopes. I was tremendously impressed by the talent and energetic dedication of Minette Cooper and Zelma Riven, two of my hosts for the weekend and two of the movers and shakers in this project. It seems possible – even likely – that they can and will achieve what they set out to accomplish. Considering the cost (and the luxury of some the materials used) of the JCC Campus, the budget for the new museum and archive building is quite modest – about $1.5 million dollars. The organization has been developing creative ways to raise this money. The building has been listed on the National Register of Historic Places, and one option being explored is the establishment of an LLC (limited Liability Company) to actually own the building, and thus as a for-profit entity, benefit from available historic preservation tax credits. Effingham Street is in downtown Portsmouth, an area essential to the long term cultural and economic revival of the city. Civic leaders have recognized this and have gotten behind the synagogue restoration project. Indeed, it was a secular local foundation that provided the first funds needed to restore the building’s roof when the project was just starting. Since then, the building has been included as part of Portsmouth’s “Path of History” that celebrates historic sites in the city with signage and public events. Portsmouth, Virginia. Path of History Signage for Cheva T'helim. As with many urban synagogue restoration projects in the United States, Jewish organizations have been slow to get involved. As in Boston, Hartford, Tucson and Phoenix and elsewhere, some see these efforts not sufficiently Jewish, or not sufficiently Orthodox, or not sufficiently something this or something that. Federations and established synagogues see historic projects as at best irrelevant and as worst as competitive for resources, for audience and for publicity. Not surprisingly, however, once grassroots and sweat-equality restoration projects are successful, the establishment is often eager – sometimes insistently – to claim them for their own. Things are not as bad as they were twenty years ago. The success of many Jewish historical projects in more than a dozen states has proven their relevance and their popularity. But in Portsmouth, it remains to be seen whether the former Chevra T’helim synagogue will be a thorn in the side of the Tidewater Jewish Community or a jewel in its crown. (ISJM) Prayers were heard in the synagogue of Dzierżoniów, Poland the first time in a quarter century last Friday night, the first night of the Rosh Hoshanah holiday. Dzierżoniów is located in the province of Dolny Śląsk about an hour’s drive from the Silesian capital of Wrocław (former Breslau). Until 1945, the city and the province were part of Germany; the city’s name was Reichenbach in Niederschlesien. 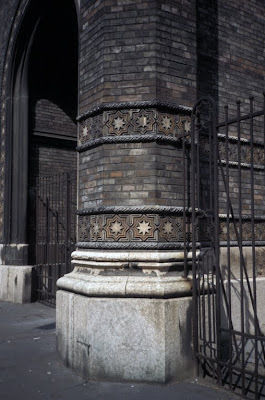 The main entrance to the synagogue, which was first opened in 1875, had been bricked up for many years and was broken open before the holiday and the entrance restored with wooden doors to ready synagogue for the religious service. Attending were about 50 Jews in their 50s and 60s – Holocaust survivors and children of survivors - who used to attend the synagogue before the exodus of Jews from the town during Communist-led anti-Jewish purges of 1968. 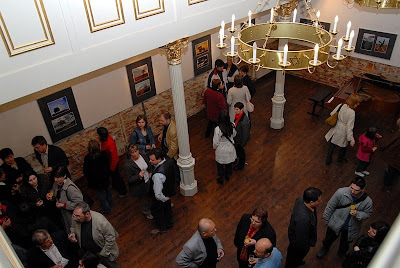 The services were held under the auspices of the Beiteinu Chaj-2004 Foundation, founded in 2004 to bring life back to the synagogue and to restore its physical form. 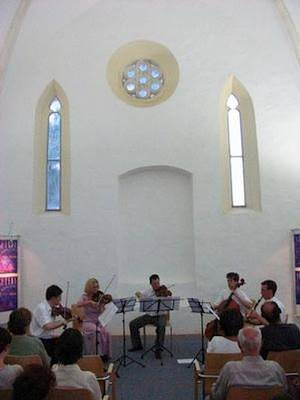 For several years the groups have been repairing the building, using it for cultural events, and linking former and present Jewish residents of the town. For an informative brochure about the synagogue and foundation click here. Click here for video of a poetry reading in the synagogue. To My Readers: Shana Tova! Best wishes for a sweet, happy, healthy, peaceful and productive New Year! Shana Tova! I look forward to hearing from you in the coming year. 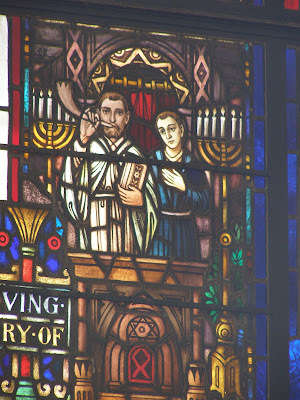 Above: Rosh Hoshanah detail from sanctuary of Beth Emeth, Albany, New York. The windows combine representational and symbolic portions of the windows from the congregation's previous home in downtown Albany (artist unknown) with abstract glass created by Robert Sowers for the new building designed by Percival Goodman and completed in 1957. 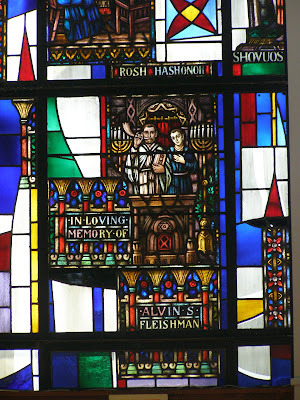 This photo is part of continuing documentation of American stained glass synagogue windows collected by the International Survey of Jewish Monuments (photos: Samuel D. Gruber/ISJM 2008). In the overgrown Jewish cemetery in Botosani, Romania, the lion is truly the king of the forest. (ISJM) Last April, the Jewish cemetery in Botosani, Romania was terribly vandalized, with many gravestones smashed. Ruth Ellen Gruber recently revisited the site as part of trip to study (Candle)sticks on Stone," a look at women's gravestones in Romanian cemeteries. You can read her report and see new photos here. Ruth's visit coincides with a strong statement issued this past week by the Federation of Jewish Communities of Romania (FedRom) defending itself against charges made by many Haredi groups that FedRom is negligent in its care of cemeteries and other sites. FedRom makes the case that it presently has the responsibility to care for 88 synagogue buildings and 821 Jewish cemeteries and the logistical and financial difficulties involved in this task are overwhelming. I can testify that despite mixed record on Jewish hertiage protection and care in the past, FedRom has in the past two years made a renewed and concerted effort to professionalize its approach. The task, however, is daunting. Romania is looking at how other countries are managing their cultural hertiage assets, but even with the best intentions and plans, the number of sites, the amount of accumulated maintenance and repair required, and the tiny budget makes even maintaining the status quo difficult. I'll post this memo and write about the situation in Romania in an upcoming post. The Web magazines ArtKnowledgeNews, ArtDaily.org and other media report that the dispute over ownership of a flower painting by German expressionist Emil Nolde, was been settled in Sweden where the Moderna Museet of Stokholm has agreed to return to Blumengarten (Utenwarf) (Flower Garden (Utenwarf)) to the heirs of Otto Nathan Deutsch, a German Jew who escaped to the Netherlands in the late 1930s. The painting was stolen by the Nazis 70 years ago from the Deutsch collection, and in 1967 surfaced and was sold to Moderna Museet. Negotiations between the art museum and the heirs - two of whom themselves are Holocaust survivors - began in 2002. The work has now been sold on behalf of the heirs to an unidentified private collector who has agreed to loan it to the Moderna Museet for five years, and then will loan a series of other, undisclosed painting for another five years. No media reports that I have read have commented on the irony of this situation - that Nolde in his lifetime was known for his expressions of anti-Semitism, or at least of his dislike of leading Jewish luminaries in Berlin and European art world. He had special dislike for Max Lieberman, leader of the Berlin Secession, and Paul Cassirer leading modern art dealer and arbiter of modern taste. The ownership dispute was settled under the principles of the 1998 Washington Conference Principles, guidelines adopted by 44 countries that outline, among other things, procedures for dealing with art restitution claims. In June, the Jewish Claims Conference, listed Sweden with countries “that do not appear to have made significant progress.” The Claims Conference estimates that the Nazis stole around 650,000 works of art of all types. The Deutsch heirs continue to search for other artworks which were lost during the Nazi period. A list can be found at the German Government website www.lostart.de. (ISJM) This October the Centum Judaicum in Berlin and the Berlin Jewish Museum and local academic partners team up to present what looks like a fascinating and important conference. The conference focuses on the spatial dimensions of the migration experience and also inquires into how migrants perceived and shaped urban space. We will be particularly interested in exploring the diverse functions and meanings of Berlin as a crucial migration center between East and West. Britta Korkowsky, The Narrator that Walks by Himself: Sklovskij's Narrator, Kipling's Cat and the Paradox of Freedom in "ZOO or Letters not about Love"
(ISJM) In August, the Jewish Museum of Baltimore announced the purchase of the site of Lenny's Deli on "Corned Beef Row" adjacent to the museum site - home of two historic 19th century synagogues. The Deli will continue to operate at its present location for the next five years, but the museums eventual expansion to the space to provide room for a new educational wing and on-site parking. The cost of the purchase was $1.5 million, made possible by a grant from the Herbert Bearman Foundation which has already been a major benefactor to the institution (an existing wing is already named for Herbert Bearman). 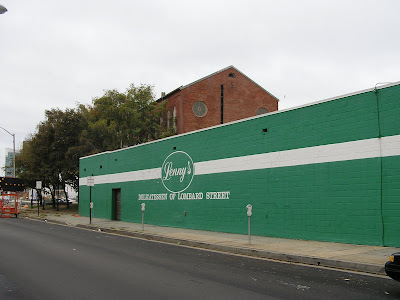 While Lenny's is viewed by many Baltimoreans of this generation as an historic institution, the Lombard (Corned Beef Row) location was opened only in 1991. Still, it is the last vestige of a much older tradition of Jewish eateries in the neighborhood. Budapest, Hungary. The Dohany Street Synagogue restored. Photo: Samuel D. Gruber, 2005. Budapest, Hungary. Before and after pictures of the Dohany facade. Photos: Samuel D. Gruber 1989 and 2005. Ruth Ellen Gruber has written for the JTA about the Dohany Street Synagogue in Budapest and the Great Synagogue in Sofia on the occasion of gala celebrations of their respective anniversaries. 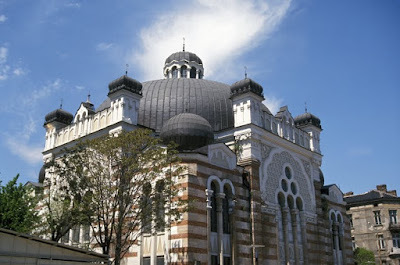 The Dohany Street Synagogue celebrates its 150th birthday, and the Great synagogue in Sofia is 100 years old. Rudolph Klein, who recently published a new book about the Dohany has supplied photos of the ceremony. Click here for Ruth's blog and Klein's and pictures. Here are some additional pictures from from my archive taken in July 1991 when the restoration was just getting underway. At that time it wasn't clear how much work had to be done and who would pay for it. Eventually the Hungarian government picked up most of the tab - probably close to $10 million dollars. When others claim credit, don't believe it. Give credit where credit is due! At the time I think this was the largest government commitment to a Jewish heritage restoration project ever...even more than the Dutch donation to the restoration of the Esnoga (to which many foundations and individuals also contributed). The Sofia synagogue had a harder time getting money. But eventually it too, has been successful. Both capital cities now boast splendid religious, cultural and ceremonial centers. Sofia, Bulgaria. Great Synagogue. Photo: Samuel D. Gruber, 2006. 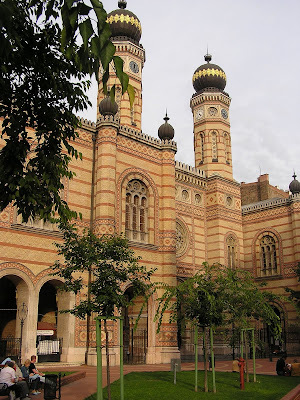 In Budapest, attention now turns to the Rumbach Street Synagogue. 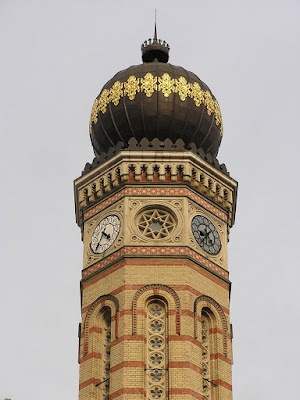 Restoration of the important Otto Wagner designed Moorish-style synagogue was interrupted in the early 1990s. 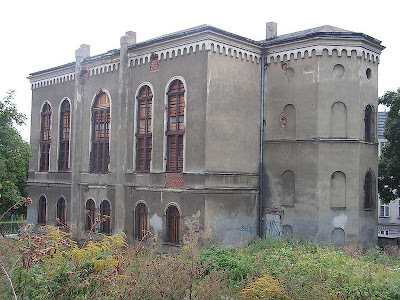 Now the Hungarian Jewish Community has prepared an ambitious plan for the building, including the creation of new and expanded Jewish Museum and educational center. I'll write more on this later this fall. 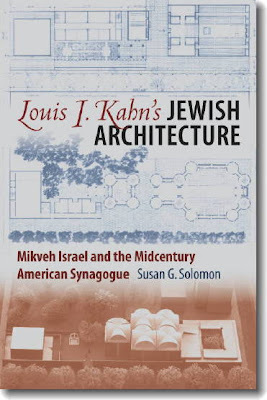 I review Susan Solomon's new book, Louis I. Kahn’s Jewish Architecture: Mikveh Israel and the Midcentury American Synagogue in today's edition of Tablet Magazine. Click here to read the review Sacred Space: Louis Kahn and the architecture of quiet reverence. The book is about more than Kahn. It contains several informative chapters on issues of ideology, aesthetics and identity in post-World War II American synagogue design. (ISJM) I've received more information about the exhibition set to open in Maribor, Slovenia on September 6th. Curator Janez Premk informs ISJM that the exhibition consists of 13 information panels (see the first panel, above)that collate much of the documentary information - including archival sources, building measurements, etc.- carried out by Dr. Premk, Ivan Ceresnjes and a research team from the Center for Jewish Art at Hebrew University, beginning in 2000. The work builds on the Commission report that I co-authored with Ruth Ellen Gruber in 1996 and that I mentioned in my previous post, but it includes much more priomary source material and has involved much closer scrutiny of existing sites, including measured drawings. 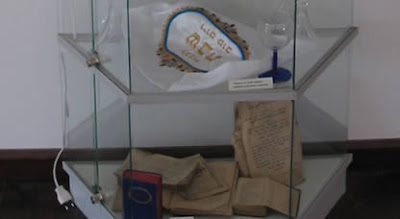 This material now is part of the Jewish Archive of Slovenia. Photos courtesy of Kulturni Center Sinagoga Maribor. On September 6, 2009, the occasion of the European Day of Jewish Culture a new exhibition on the Jewish heritage of Slovenia will open in the restored medieval synagogue of Maribor. According to researcher Janez Premek a major part of the exhibition is based on research carried out by Ruth Ellen Gruber and myself in the 1990s and first published in 1996 (updated 2005) in a report by the US Commission for the Preservation of America’s Heritage Abroad. The exhibition will open at 11 in the morning on the 6th, and Premk will give a tour of the exhibition at noon as part of the opening ceremonies. At that time the first release of the US Commission sponsored survey (1996) the government of Slovenia pledged to produce a book or booklet using this material to present and promote the Jewish history and sites of Slovenia – something that never came to pass. 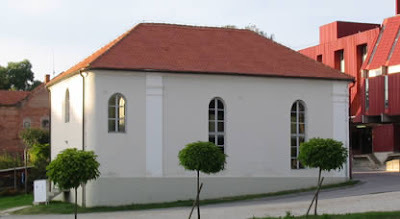 Meanwhile, the former medieval synagogue in Maribor has been restored and developed as a center of Jewish culture. It is appropriate that this exhibition be held in this space, and I hope that something lasting – in print or on line – comes of Janez’s efforts. He tells me that in recent years some additional site have been identified, and (partly through his efforts) more archival materials relating to the Jewish history of the region have been found. Dr. Premk tells me that there is a project in the planning stage to create an Institute for Jewish Studies in Maribor, perhaps as early as 2010. When I learn more about this, I will report more in detail. The Maribor synagogue is one a handful former medieval synagogues that have been rediscovered and redeveloped in the past decade. 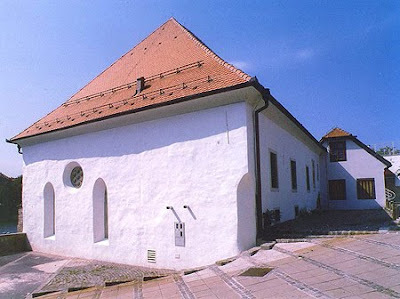 This building, probably originally a double-nave synagogue similar in plan to those in Worms, Prague and Vienna, also served for many centuries a church after the expulsion of the Jews from Maribor in 1493. 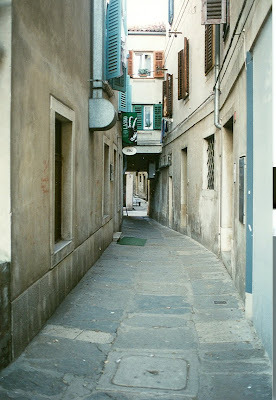 Top: Piran, Slovenia. Zidovski trg., Bottom: Koper, Slovenia. 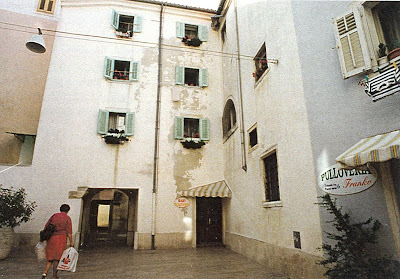 Former Zidovska ulica. Photos: Ruth Ellen Gruber/U.S. Commission for the Preservation of America's Heritage Abroad (ISJM archive). 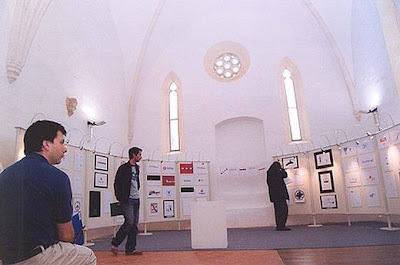 Other events will take place in Slovenia on September 6th in Lendava, where the former 1866 synagogue (now a cultural center) will be open with a small exhibition. There will also be tours of the Jewish history and sites of the town. Lendava, Slovenia. Former Synagogue, now cultural center. Photos: Lendava municipality (posted on web at time of Center inauguration, link now dead). For the most complete account of Jewish heritage sites in Slovenia see the jewish-heritage-europe.eu Slovenia page. For links to events in other countries click here.